.PUMA Ransomware File Extension is a malicious file-encrypting application from the STOP Ransomware family, for example, KEYPASS Ransomware. It marks the files it encrypts with .puma, .pumax, .pumas, and other extensions alike. Meaning there might be quite a few version of this malware. If you came across one of them, we invite you to read our report and learn more about it. Later in the text, we explain where the malicious application could come from, how it might affect the infected system, and also how it could be deleted. 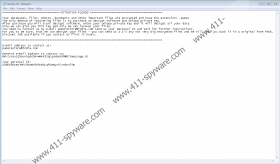 Moreover, at the end of the article, you can find step by step instructions showing how to get rid of .PUMA Ransomware File Extension manually. The task might be difficult, and if you are an inexperienced user, it might be better to leave it to a reliable security tool. Our specialists believe .PUMA Ransomware File Extension could enter the system with Spam emails or suspicious installers downloaded from untrustworthy web pages. The launchers of both our encountered versions looked like installers for Windows updates. No doubt, inexperienced users could open such data without realizing it could be harmful. What it is essential to know is installers, and other data should always come from legit websites (or reputable senders in case the file is received via email), and if they do not, you should never open such data without scanning it with an antimalware tool first. Otherwise, you could easily infect your device with vicious threats and put your files or privacy in danger unknowingly. What’s more, according to our specialists, .PUMA Ransomware File Extension might show a fake system pop-up notifying that an important Windows update is being installed. It should state that the user should not close it or turn off the computer. Naturally, the hackers would not like it since shutting down the device could interrupt the encryption process. Also, at the same time, the malware could try to disable the Windows Defender and crash the explorer.exe process. Once the fake update’s process is completed, the victim’s videos, pictures, documents, and other files considered to be personal should become encrypted. To identify affected files the user only needs to take a look at their titles since all of them ought to have an additional extension (e.g., flower.jpg.pumas). Next, .PUMA Ransomware File Extension is supposed to create a text document named !readme.txt. Inside of it, you should find a message from the malicious application’s developers. It explains the user can get a decryptor to decipher his data. Of course, the victim has to pay first and to learn how to do so the user is asked to email the cybercriminals. The reason we would not advise doing it is that the hackers could trick you and the money might be lost in vain. Besides, recently a group of IT specialists was able to create a decryption tool that can decipher data affected by this threat. It can be found on the Internet, and it is entirely free. If you think you should erase .PUMA Ransomware File Extension instead of putting up with its developers' demands, we can offer you the removal instructions located below. It would be best to take a look at them first and determine whether they will not be too difficult for you to complete. In case they seem too challenging, it would be better to restart in Safe Mode as explained below and scan the computer with a reliable antimalware tool that you should be able to acquire if you choose Safe Mode with Networking. Once the scan is over, you should be able to eliminate .PUMA Ransomware File Extension by clicking the provided removal button. Tap Win+I or navigate to the Start menu and click the Power button. Tap and hold Shift and click Restart. Select Troubleshoot and choose Advanced Options. Pick Startup Settings and press Restart. Click the F5 key and reboot the system. Open Start, press Shutdown options and tap Restart. Press and hold the F8 key when your computer is restarting. Wait till you see the Advanced Boot Options window. Press Enter and log on to your computer. Find a malicious file downloaded before the malware appeared (e.g., updatewin.exe). Right-click the doubtful file and select Delete. Locate a file with the .tmp.exe extension, e.g., c457.tmp.exe. Right-click it and press Delete. Find folders with random names, e.g., 98476567-cf82-2ac9-c730-d7b68b0c107a. Right-click them and press Delete. Insert Regedit and click OK. Locate a value name called SysHelper.